Hello, future Bride and Groom! Congratulations on your newly engaged status. We're very excited for you and even more excited to help you coordinate a beautiful event. Whether you come to us by recommendation or stumbled upon us through your wedding invitation research, you are in the right place for finding the perfect wedding invitation to fit your style and budget. 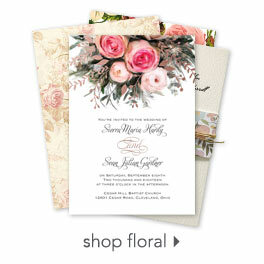 Invitations by Dawn has been a leader in the wedding invitation printing industry for more than 30 years. We understand the attention to detail and dedication involved in printing quality wedding invitations in all sorts of styles. In fact, we specialize in designing wedding invitations to fit your specific wedding style and your personalities. A few of our more popular styles of wedding invitations include destination and beach wedding invitations, vintage wedding invitations, traditional wedding invitations, rustic wedding invitations and modern wedding invitations. We also offer unique wedding invitations for a great value, like seal and sends and affordable letterpress wedding invitations called the Featherpress™ Collection. Although we focus largely on wedding invites, there are many other wedding necessities you will find to help create a coordinated look throughout your wedding ceremony and reception. We offer save the dates in a variety of fun designs and beautiful colors. You will also find an entire category dedicated to wedding stationery, which includes response cards, reception cards, map cards, wedding programs, menu cards and more. Many of these items are available in designs that match our wedding invitations perfectly. After you have chosen your wedding stationery, it's time to accessorize the wedding reception! You may choose to add a personal touch to the bar and reception tables with personalized wedding napkins in your choice of colors, or you might choose unique wedding favors to impress your wedding guests. Create a place card table at the reception entrance with beautifully printed place cards to help guests find their seats as soon as they arrive. Add some impressive decorations or floral arrangements to make it a stunning focal point. Whatever accessories you choose, your wedding reception is sure to shine!